Sets were going to bring tabs to File Explorer and other Windows applications. An early version of Sets once appeared in Windows Insider builds, but Microsoft pulled it. 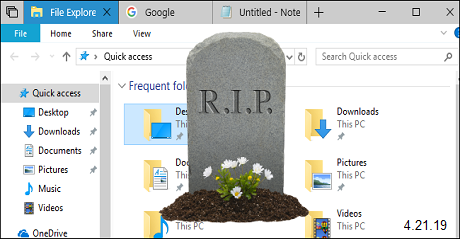 Now, according to Microsoft’s Rich Turner on Twitter, Sets is “no more.” We were really looking forward to Sets, as we’ve always wanted tabs in the File Explorer as well as console windows like the Command Prompt, PowerShell, and even Linux Bash shells on Windows. Tabs in other applications like Notepad would be really cool, too. Sets offered native tabs any application could use. Here’s how Sets worked when it was available in Windows Insider builds for a short time a year ago. Back in June 2018, Microsoft removed Sets tabs from the Windows Insider build and thanked users for their “valuable feedback… as we develop this feature helping to ensure we deliver the best possible experience once it’s ready for release.” Microsoft has been pretty quiet about Sets ever since. In December 2018, Windows Central’s Zac Bowden claimed Sets wasn’t “canceled” according to his sources at Microsoft. But, five months later, Sets is looking pretty canceled. In response to a question about when a tabbed console environment would arrive, Microsoft’s Rich Turner said: “the Shell-provided tab experience is no more”—he’s referring to Sets. Turner also said, “adding tabs [to the console] is high on our to-do list.” Surely Microsoft wouldn’t be working on adding tabs to the console if those native operating system tabs were still their way any time soon. Get caught up on OUR FORUM. After seven years of development, Super Mario Bros. has been ported from the Nintendo Entertainment System (NES) to the Commodore 64. According to developer ZeroPaige, they have been working on this implementation for seven years and have been able to create an almost perfect C64 port Super Mario Bros. as it appeared for the NES in 1985. "This is a Commodore 64 port of the 1985 game SUPER MARIO BROS. for the Famicom and Nintendo Entertainment System,' stated in a post to the Lemon64 forum. "It contains the original version that was released in Japan and United States, as well as the European version. It also detects and supports a handful of turbo functionalities, and has 2 SID support." ZeroPaige has released the port as a C64 disk image file that can be used directly on the Commodore 64 console or through C64 emulators. Below is a picture of the Super Mario Bros. port being played using the VICE C64 emulator. While most users have stated that the game is an almost perfect reproduction, some issues have been reported such as minor lag at times, music running a faster than the game, fireballs not traversing screens, or jumping suddenly no longer working. ZeroPaige explains what causes each of these bugs and that some of them may be tied to the emulator or joystick being used. BleepingComputer has reached out to ZeroPaige to find out if they have been contacted by Nintendo regarding this release, but we have not had a reply at the time of this publication. Follow this and more on OUR FORUM. Some Microsoft employees are openly questioning whether diversity is important, in a lengthy discussion on an internal online messaging board meant for communicating with CEO Satya Nadella. Two posts on the board criticizing Microsoft diversity initiatives as “discriminatory hiring” and suggesting that women are less suited for engineering roles have elicited more than 800 comments, both affirming and criticizing the viewpoints, multiple Microsoft employees have told Quartz. 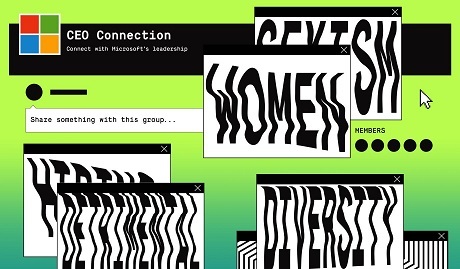 The posts were written by a female Microsoft program manager. Quartz reached out to her directly for comment and isn’t making her name public at this point, pending her response. “Does Microsoft have any plans to end the current policy that financially incentivizes discriminatory hiring practices? To be clear, I am referring to the fact that senior leadership is awarded more money if they discriminate against Asians and white men,” read the original post by the Microsoft program manager on Yammer, a corporate messaging platform owned by Microsoft. The employee commented consistently throughout the thread, making similar arguments. Quartz reviewed lengthy sections of the internal discussion provided by Microsoft employees. “I have an ever-increasing file of white male Microsoft employees who have faced outright and overt discrimination because they had the misfortune of being born both white and male. This is unacceptable,” the program manager wrote in a comment later. The Microsoft employees who spoke to Quartz said they weren’t aware of any action by the company in response, despite the comments being reported to Microsoft’s human resources department. Full details posted on OUR FORUM. Broadcom WiFi chipset drivers have been found to contain vulnerabilities impacting multiple operating systems and allowing potential attackers to remotely execute arbitrary code and to trigger denial-of-service according to a DHS/CISA alert and a CERT/CC vulnerability note. 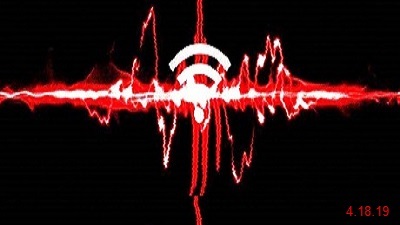 Quarkslab's intern Hugues Anguelkov was the one who reported five vulnerabilities he found in the "Broadcom wl driver and the open-source brcmfmac driver for Broadcom WiFi chipsets" while reversing engineering and fuzzing Broadcom WiFi chips firmware. As he discovered, "The Broadcom wl driver is vulnerable to two heap buffer overflows, and the open-source brcmfmac driver is vulnerable to a frame validation bypass and a heap buffer overflow." The Common Weakness Enumeration database describes heap buffer overflows in the CWE-122 entry, stating that they can lead to system crashes or the impacted software going into an infinite loop, while also allowing attackers "to execute arbitrary code, which is usually outside the scope of a program's implicit security policy" and bypassing security services. As the CERT/CC vulnerability note written by Trent Novelly explains, potential remote and unauthenticated attackers could exploit the Broadcom WiFi chipset driver vulnerabilities by sending maliciously-crafted WiFi packets to execute arbitrary code on vulnerable machines. However, as further detailed by Novelly, "More typically, these vulnerabilities will result in denial-of-service attacks." Learn more by visiting OUR FORUM. Chipmaker Intel has announced today that it will be canceling production of its 5G modems. Stating that they aim to focus on PC, ‘Internet of Things’ devices, and data focussed devices, however, they intend to make components to help improve 5G infrastructure. This comes just hours after Qualcomm announced a 6-year partnership with Apple. In his statement, Intel CEO Bob Swan made it clear that there was ‘no path to profitability and positive returns’ when talking about the smartphone modem business. Swan went on to mention that “5G continues to be a strategic priority across Intel”. This comes just two weeks after Intel rebuffed a report suggesting the company was struggling with its 5G modem program. A similar situation occurred in 2018 when it was suggested the manufacturer was having troubles with its XMM 8060 Modem, the predecessor to the 8160 that was canceled today. 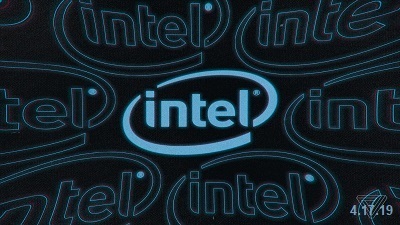 Intel went on to say they would provide additional details on April 25, following their Q1 2019 earnings report. Swan closes out his statement saying “[the Intel] team has developed a valuable portfolio of wireless products and intellectual property. We are assessing our options to realize the value we have created, including the opportunities in a wide variety of data-centric platforms and devices in a 5G world.” current speculation suggests the company may be looking to sell its portfolio of products. Follow this and more on OUR FORUM. E3, also known as ‘The Electronic Entertainment Expo’ and ‘one of the hottest gaming events out there’, is just under 2 months away. Microsoft has announced their intentions for the event, and it’s looking pretty good. 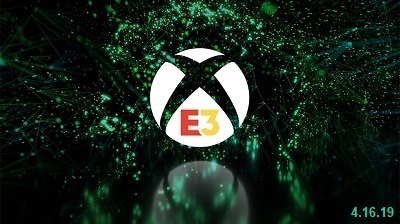 Will Tuttle, Xbox Wire Editor in Chief, says that this will be Microsoft’s ‘biggest E3 presence ever’ and that there’s ‘something for everyone’. The annual Xbox E3 2019 Briefing is up first, on June 9th. The briefing will encompass everything from reveal trailers for unannounced titles that are due out in 2019 to in-depth looks at previous games. You can watch it live on Sunday, June 9th, at 1 pm PDT/4PM EDT on the official Xbox Mixer Channel or on the Mixer app for Xbox One and Windows 10. The Xbox E3 2019 Briefing will also be offered in six different languages on Mixer: English, German, French, Italian, Spanish (LATAM), and Portuguese (LATAM). There are also English closed captions for those who want or need them! Inside Xbox will also be airing a special episode during E3. Inside Xbox: Live @ E3 will air on Monday, June 10th, at 3 pm PDT/6PM EDT. It’ll feature a live stream of exclusive announcements, game demos, interviews, and more. If you’re lucky enough to be attending E3 in person, Microsoft has plenty of opportunities for you too! The Microsoft Theater and Xbox Plaza at LA Live will be their base for all activities during the week. Xbox Experience will be returning to the Microsoft Theater and it’ll be open from Tuesday to Thursday. There are over 100 gameplay stations on the main stage and a ginormous Xbox merchandise shop.Learn more by visiting OUR FORUM.